Earlier this month, the North Carolina State Board of Education voted on and passed the revisions made by the Department of Public Instruction (DPI) to the Common Core Math Standards. The fears that DPI’s changes were actually going to be nothing substantial have been proven correct. These revisions were basically cosmetic only, as a preview of a yet to be published paper by J.R. Wilson has revealed. Wilson, who has over 30 years of experience in education, is in the process of comparing revisions and changes being made in states who adopted the Common Core. Wilson is using mainly grade 2 and a few selected standards from grades 4, 5, and 6 where the use of standard algorithms is present and required. J.R. Wilson also co-authored a report on the deficiencies of the Common Core math standards alongside Erin Tuttle for the American Principles Project. North Carolina adopted the Common Core State Standards on June 3, 2010. Seven years later, on June 1, 2017, the North Carolina Board of Education adopted a revised set of math standards. The available documents did not have any introductory information at the time the standards were reviewed. The standards for each grade level begin with the eight CCSS Standards for Mathematical Practice without any narrative provided. The CCSS-M coding is used with NC added to the beginning of each standard’s code. Seven of North Carolina’s twenty-three “new” grade 2 standards are identical to corresponding CCSS-M standards. An additional nine new standards show minor changes like the inclusion of bullet points, added commas, or slight word changes. The remaining seven grade 2 standards were formed by insignificant changes made to CCSS-M standards. One grade 2 CCSS-M standard has been incorporated into another and two standards have been removed. NC.2.NBT.6 says to add up to three two-digit numbers while CCSS-M 2.NBT.6 says add up to four two-digit number, otherwise they are identical. The minor and insignificant changes North Carolina has made to the grade 2 standards leaves their new adoption identical in essence to the CCSS-M.
Wilson continues with his analysis, noting that changes made in some cases made a standard more specific yet “at the same time more limiting” and that there are no real changes in substance. North Carolina has changed CCSS-M 4.NBT.4 but not its substance. CCSS-M 4.NBT.4 reads, Fluently add and subtract multi-digit whole numbers using the standard algorithm. The NC.4.NBT.4 version reads, Add and subtract multi-digit whole numbers up to and including 100,000 using the standard algorithm with place value understanding. Changes made to CCSS-M 5.NBT.5 provide greater specificity while at the same time are limiting. CCSS-M 5.NBT.5 says, Fluently multiply multi-digit whole numbers using the standard algorithm. NC.5.NBT.5 says, Demonstrate fluency with the multiplication of two whole numbers up to a three-digit number by a two-digit number using the standard algorithm. The requirement for the standard algorithm in division was dropped in one standard, yet then turns around and uses standard algorithms for division using decimals. North Carolina drops the requirement for using the standard algorithm for division in NC. 6.NS.2, which says, “Fluently divide using long division with a minimum of a four-digit dividend and interpret the quotient and remainder in context.” Compare that to CCSS-M 6.NS.2, “Fluently divide multi-digit numbers using the standard algorithm.” With decimals, North Carolina requires fluently use the standard algorithms for addition, subtraction, multiplication and division of decimals in NC.6.NS.3. Boiled down: This was not a revision. What DPI did was a series of editing and format changes. Parents concerned about Common Core and the lack of an even average education the standards are currently delivering should be outraged that what the North Carolina Board of Education and DPI just did. 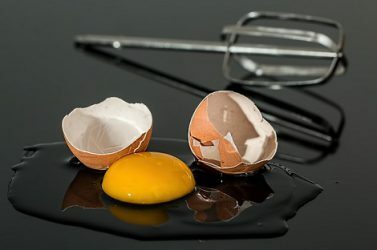 If you crack an egg and stir it as it cooks in the frying pan, you still have an egg. It may be scrambled but it is still an egg. Well, DPI didn’t even scramble the eggs. If DPI even broke the yoke, it was just barely. More like eggs over easy… real easy. This entry was posted in Am Lens, Common Core, EDUCATION, NC DPI and tagged Common Core Revisions, Lipstick on a Pig, NCDPI. Bookmark the permalink.